A Chempump NC series canned motor pump is used to load anhydrous HF acid into tank cars at a DuPont plant in Texas. The pump is equipped with backup shaft bearings made of Vespel® CR-6100. The pump’s primary shaft bearings are made of silicon carbide. 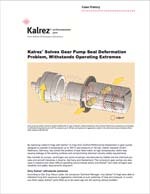 The process fluid provides bearing lubrication. Process temperature is ambient. Safety and reliability: The function of the backup bearing is to prevent the rotor from falling, which could allow the escape of HF from the containment area in the event of a primary bearing failure. In the past, the pump used silicon carbide parts for both primary and backup bearings. The use of a backup bearing material with different properties from that of the primary bearing increases safety. Long life: Thanks to the outstanding resistance of Vespel® CR-6100 to HF and its low wear and friction, the backup bearing shows potential for extended life. When removed for inspection in August 2005, after five years of intermittent service with exposure to HF for the entire time, the Vespel® CR-6100 bearing showed no evidence of deterioration. 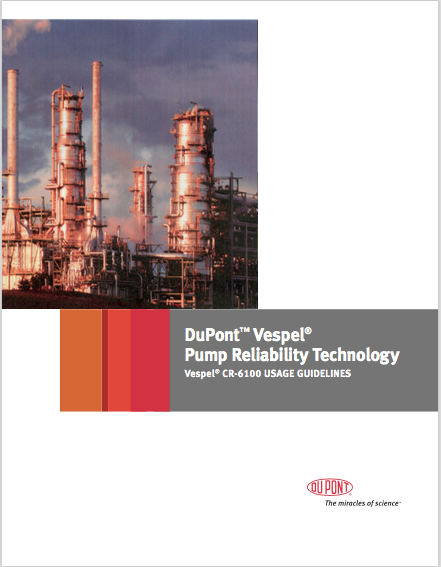 DuPont™ Vespel® CR-6100 was selected for backup shaft bearings in this aggressive process-lubricated environment because of its resistance to anhydrous HF, low friction, low wear, high PV capability, dimensional stability and low coefficient of thermal expansion (70% lower than that of carbon steel). Vespel® CR-6100 is an advanced composite material consisting of DuPont™ Teflon® PFA fluoropolymer resin and oriented carbon fibers.